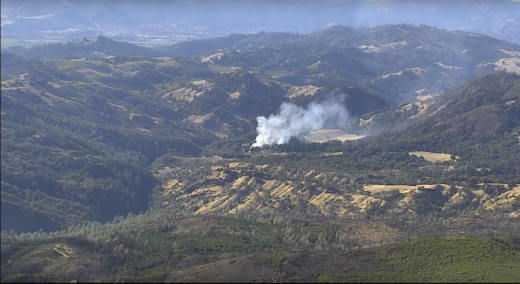 Newly installed wildfire cameras in Sonoma County helped firefighters quickly spot and suppress a fire burning east of Geyserville this week, county officials said. After receiving 911 reports of smoke coming from near Pine Mountain, east of Cloverdale, around 4 p.m. on Tuesday, officials from Cal Fire say they checked a camera on Pine Mountain to see if they could spot the blaze but saw nothing. Next, they checked a second camera on Geyser Peak and spotted the blaze on Pocket Ranch Road. Officials then dispatched fire personnel to the wildfire, and crews were able to contain the blaze — dubbed the Coyote Fire — at one acre. In a time lapse recorded by the camera atop Geyser Peak, a helicopter can be seen flying over the blaze as personnel drop water on it. According to county officials, firefighters were able to use a nearby pond to douse the fire. "This was really the perfect-case scenario for the use of these cameras to locate fires," said Barry Dugan, senior programs specialist for the Sonoma County Water Agency. "It was very clear that it would have taken firefighters a lot longer to locate this fire without the fire cameras," Dugan said. Ben Nicholls, Cal Fire division chief for Sonoma, Lake and Napa counties, echoed that sentiment in a statement. "This was critical in terms of saving time by not committing resources to the wrong location and being out of position," he said. The camera on Geyser Peak is one of five that were installed around Sonoma County this fall. The Board of Supervisors in August approved a proposal to spend $477,000 on eight cameras around the Lake Sonoma watershed in the northern part of the county. Officials hope to have the remaining three installed by the end of the year. According to Dugan, the county decided to move forward with the fire camera program as a result of the devastating North Bay fires in October 2017. "The North Bay fires last October were really the starting point for this project," he said. "Immediately after the fires, we realized that our largest water supply [Lake Sonoma] was vulnerable to catastrophic wildfire. We've known this, but the North Bay fires really brought it home." In the event of a large-scale wildfire, Lake Sonoma could be subject to sedimentation, causing complications with the region's water supply system, Dugan said. A spokeswoman for Pacific Gas and Electric Co. said in a statement that the utility is also committed to funding nine additional fire cameras throughout Sonoma, Napa and Marin counties. PG&E hopes to have three installed in each county before the end of the year. These aren't the first fire cameras to be installed in California. There are cameras around Lake Tahoe, San Diego, Orange County and other areas in Southern California. They're all part of the ALERTWildfire camera network, a collaboration between experts at the University of Nevada, Reno, University of California San Diego and the University of Oregon. Footage from all of the ALERTWildfire cameras — including the newly installed ones in the North Bay — can be streamed at the ALERTWildfire website.